Some may think that the days of hard-hitting, brutal melodic death may be something more relegated to the past. After all, most think of the music and immediately move towards more modern (clean/harsh) approaches. But apparently no one showed Bloodhunter the memo about this change, as they swing in a decidedly brutal direction, and in turn, craft something a bit more monstrous and engaging than you may expect. 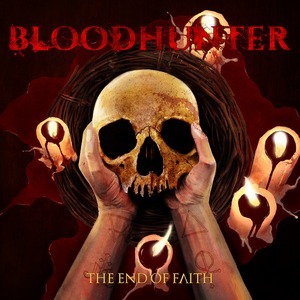 It’s almost unfair to simply lob the melodeath tag at Bloodhunter given its current definition, but the fact remains that beneath the brutal riffing and vocals, it’s pretty damn catchy. A quick comparison would be to picture Arch Enemy if they went in a more abrasive, death metal driven direction. The band frequently injects some melodic leads and solos to juxtapose the heavy riffing, and the results speak for themselves. The riffs themselves manage to hit the mark with their energy, but the leadwork gives it that added heroic nature. Just check out the instrumental “Death & Rebirth” to get a gauge on this notion. They do a good job of switching things up from a dynamic standpoint, with faster and aggressive cuts (the title track) bringing full fury to the table while other mid-tempo numbers can hang in more groovy territory and really highlight the melodies (“Spirits of Sin”). The bass even gets some spotlight, which is a real rarity in these waters, and is especially pleasing (“Possessed by Myself”). As it’s been eluded to, staying in the heavier range means the vocals do the same, with Diva Satanica launching vicious screams and growls that match the intensity of the music and propel it forward. In the end, if you are looking for death metal that is a bit raw but still brings plenty of melody, The End of Faith will meet all your expectations. With so much melodic material moving into more modern waters, it’s nice to see a band that can still unload some destruction while they gloriously shred.